Description: Regular cab, pillars, rocker & floor, door sill, Tundra. Access cab, pillars, rocker & floor, door sill, Tundra. 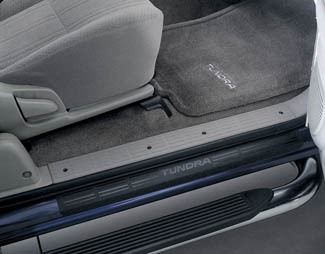 Protect your vehicle's interior against everday scuffs and scrapes while providing a slip resistant surface. ►Click to view online promo codes for Toyota parts and accessories! Why Choose Conicelli Toyota Parts? Conicelli Toyota has been selling parts online for the last 20 years and we are still going strong to this day. We are 100% committed to satisfying each and every one of our customers. When you purchase parts from Conicelli Toyota Parts you are purchasing more than parts, you also become part of our total commitment of service and excellence for years to come. There are several places online to find Toyota parts, so why choose Conicelli Toyota Parts? First we only sell 100% Genuine Toyota and Scion Parts and accessories backed 100% through Toyota Limited Parts Warranty giving you the peace of mind knowing the parts you are buying will fit right and are covered by Toyota. We offer many ways to order parts, including your tablet or smartphone and guarantee all the parts you buy will fit right by giving us the VIN number when you place an order. Combine that with our super-fast, affordable shipping and knowledgeable factory trained parts staff you will see why thousands every day experience the Conicelli Toyota Parts difference! Toyota Parts only sells genuine OEM Toyota car parts and accessories. These products are specifically manufactured and engineered to fit your car, truck or SUV just like the original parts that it came with when you first purchased it. When repairing your Toyota vehicle using the highest quality materials not only provides you with the best possible fit, but also ensures premium reliability and safety. When we say we offer Toyota parts at a discount, it means you’ll not only get a great deal – you’ll also get the highest quality Toyota OEM parts as well – that’s the Conicelli Toyota Parts way! Conicelli Toyota Parts started way back in the late 90’s and we are still going strong. At Conicelli Toyota/Scion,customers satisfaction is our number one goal, and that means treating you right from the time you first contact us. A sale is never enough; we want to back up the transaction with the very best service that can be offered in every department. A dealership of unsurpassed quality and integrity, we are 100% committed to satisfying each and every one of our customers above and beyond their expectations. Through constant review and improvement, we continue to raise our standards of excellence. When you purchase parts from the Conicelli Toyota Parts you are purchasing more than just parts. You also become part of our total commitment of service and excellence for year's to come.